Creamy and complex, a fruity and herbal flavor that can only come from a superior authentic Extra Virgin Olive Oil from Greece, Vrisi 36, the region of Lakonia (Bold and Robust) or Messenia (Delicate and buttery). Undoubtedly you will taste the difference of this superior authentic Extra Virgin Olive Oil. Add the extra virgin olive oil to the potatoes first, mixing fully, and then add your milk or cream. This too will help you achieve your ultimate goal of smooth and fluffy potatoes. Adding cream cheese just before the Vrisi 36 Olive Oil can also create a superior tasting and creamy mashed potatoes. Cream cheese, sour cream and yogurt are a popular additions to mashed potatoes. They all add a nice dairy tang and contribute to a creamy texture. Feel free to substitute some or all of the half-and-half with either of these ingredients if you like a little tanginess in your mashed potatoes. Chop potatoes to evenly sized chunks. Bring to a boil in a large pot of salted water; cook for 10 to 15 minutes (depending on the size of the chunks) until potatoes easily split apart when poked with a fork. Drain potatoes, then return to pot and set over low heat. Mash potatoes with a potato masher on the heat for 1 to 2 minutes (doing so will allow the excess moisture to evaporate). Remove from heat and continue mashing until mostly smooth. 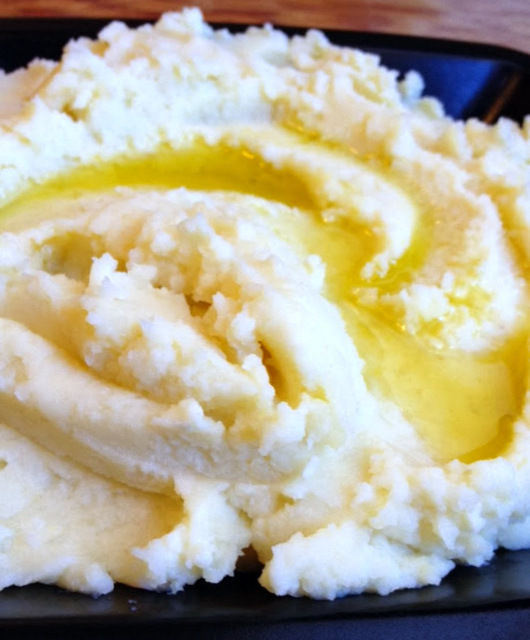 Add olive oil and mash to incorporate, then add half and half, salt, and pepper and mash until smooth and creamy. Optionally add 2-4 additional tablespoons of milk to achieve desired consistency. Transfer to a serving bowl. Drizzle with olive oil.